The full name is actually Inside Out Grilled Hot Ham and Cheese on Very Berry Bagel, but that’s a mouthful– HA! Well, it’s wintery out there (January and all) so warm comfort foods battle the treadmill and gym memberships for all of us. 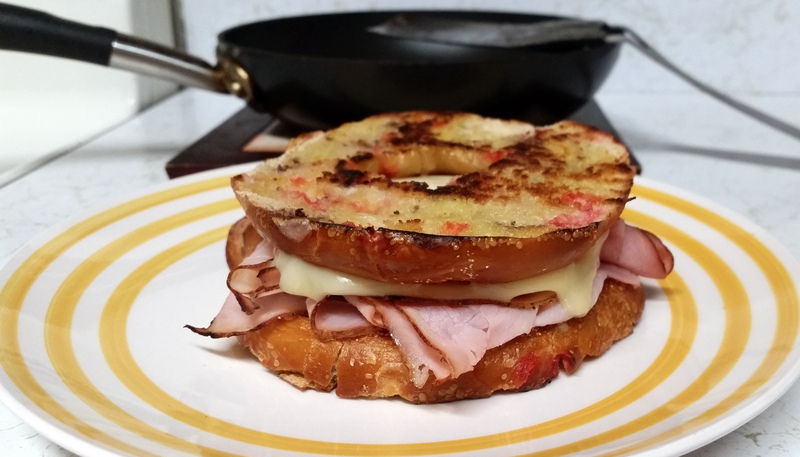 We’re keeping up the fight and packing the gym bag for today, hoping our feet find our way there so we can work off this collection of melted American cheese and black forest ham, mixed with the subtle hint of fruit flavor from the bagel, grilled well with a hint of butter. You can’t see the hidden gold here– the bottom bagel hole, sealed shut by crispy, browned cheese. Texture, people– it’s the feeling of life.